I have had this little ditty on the tip of my tongue all weekend. Sumac, sassafras and sycamore…..it should be a song on Sesame Street or a tune for gardening on ITunes, however why did I choose these three as I embraced the trees just showing off their autumnal attire??? Each of these trees gives us MORE than just fall color. They give back to nature and add to the beauty of every season. Sumac started catching my eye a few weeks ago when the foliage started changing colors. 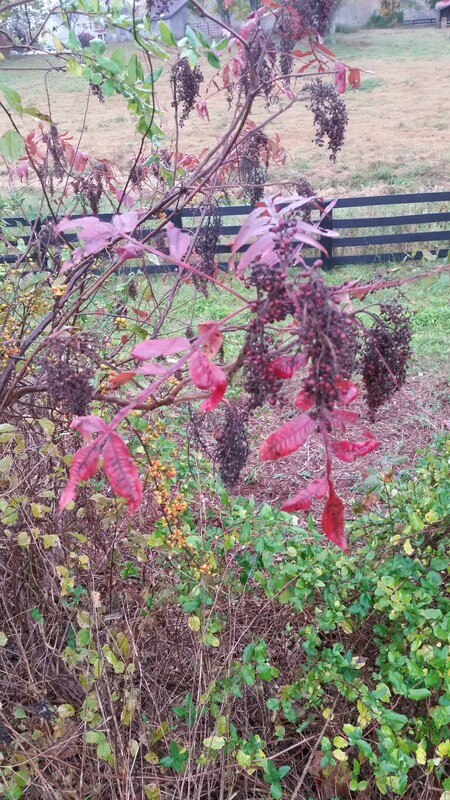 Rhus glabra and Rhus aromatica are among the list of native plants that provide for our pollinators in the winter. Sumac can form thickets in naturalistic settings which also helps wildlife during the winter months. The Xerces Society also states that this is a larval host plant for the Hairstreak butterfly. It is a native species in 48 states. Another native, is one that I remember my Mom identifying the leaves as a familiar part of her youth. 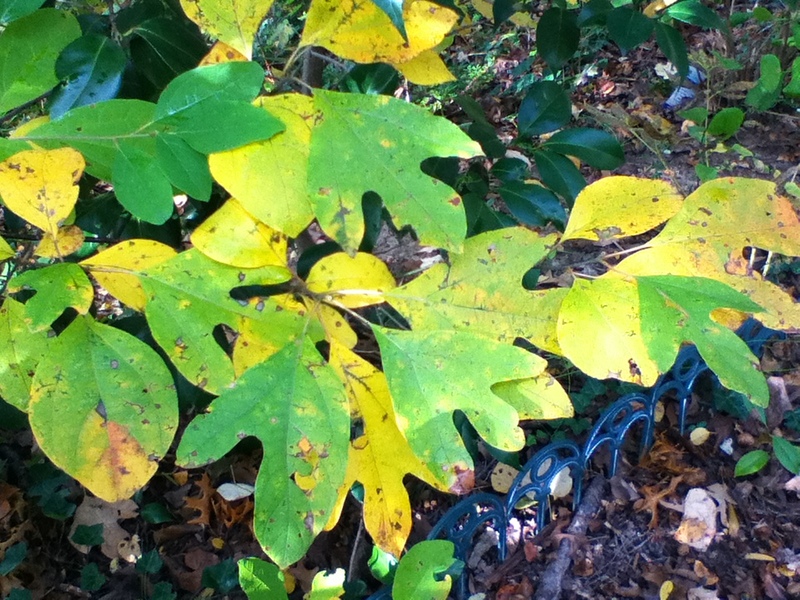 When I purchased my first home in Virginia, my Mom pointed out that I had a Sassafras tree. My Mom remembers drinking tea, made from the root and drinking a sweet root beer type drink she called Sasparilla with her grandparents. Culturally, this was a common practice in her family especially when one had a bad cold. The leaves are also commonly used as a seasoning known as “file”, a necessary ingredient for creole cooking. One could also make a toothbrush out of a twig that had been flattened and frayed. Once Safrole oil, produced by the Sassafras tree was found to be poisonous to rodents, Sassafras was banned for use in mass produced foods and drugs in 1960. I often wonder if Native Americans could use it responsibly, perhaps if we responsibly used this native plant, we could be tasting real root beer today. Usually Sassafras albidum trees are found in fields, along fencelines and sometimes on the grounds where old homes once stood. The leaves and twigs emit a citrus like scent when they are bruised. The leaf shape is usually referred to as mitten like. Birds and mammals usually eat the leaves, bark, stems and fruits. Deer and black bears love this tree and rabbits are known to partake of its bark as well. The fruits are enjoyed by many, many birds from Northern mockingbirds, gray catbirds to wild turkey’s, to name a few. The fall color, along with the leaf shape makes this tree identifiable by the kaleidoscope colors this time of the year. I have seen these fresh green leaves turn deep orange, red, a pinkish hue, deep purple to yellow. Such a gift in the garden….but I will pass on making the tea….unless I find a good recipe! This leaves me with the Sycamore, also known as Platanus occidentalis. A very large tree that tends to grow along streams, or wetlands. I have seen them used as street trees and Sycamore trees stick out at any time of the year by their interesting bark. Even after the leaves quickly turn brown and drop, the bark peels off in large flakes, leaveing quite an artistic appearance to the trunk of this native tree. The flowers form a tight cluster shaped like a ball called Achenes. In fact, they were even used as buttons in Colonial days due to their firmness and are sometimes known as buttonball trees. The fruits or seed balls are light weight and easily spread by wildlife, as well as the wind. Sycamores grow and play nicely when you see Silver Maples, Yellow Poplar trees, Sweet gum and Black Willow trees. The wildlife that can usually be found enjoying this native tree range anywhere from Gray squirrels, Purple Finches, American Goldfinches to Muskrats. Wood ducks have even been know to use them as homes when these majestic beauties age. An old Sycamore can become hollow in the middle….I can just hear the woodpeckers pecking for those insects now!!! I wonder if they hum as well?? I hope that I have shown you how communing with nature can create a song in your heart that lingers in your mind. As I continue to embrace the awesome beauty of the colors natures gifts us with each fall, I will continue to hum or sing…and always share.